Even as Universal Health Services adds money to a now $43 million pot related to the federal government's investigation into its behavioral health facilities, the for-profit hospital chain says the looming settlement isn't slowing down its dealmaking. King of Prussia, Pa.-based UHS added $9.5 million more to the settlement fund in its second quarter of 2018, and $22.5 million over the six-month period that ended June 30. While the pace of the Justice Department's investigation into UHS' behavioral health facilities, now in its fifth year, has been slower than UHS would like, the company hopes to reach a resolution by the end of the year, UHS' CFO Steve Filton said on an investor call Thursday morning. "The process of offers and counter offers and demands and counter demands continues," Filton said. Meanwhile, UHS' enthusiasm for mergers and acquisitions is stronger than ever. Filton said the company is especially interested in not-for-profit hospitals and health systems, despite the fact that deal activity between not-for-profit systems has limited the number of opportunities for UHS. "We continue to find not-for-profit systems, which I think are from our perspective the most rich assets that we look at," he said. "There are a number in the pipeline and we continue to evaluate them." The company has also been aggressively expanding its own offerings, especially freestanding emergency rooms and adding beds and surgical capacities in several of its new hospitals in California, Las Vegas and Dallas, Filton said. UHS spent $181 million on capital expenditures during the second quarter. Earlier this month, the company opened the Lancaster Behavioral Health Hospital in Pennsylvania, and later this year will open another behavioral health hospital in Spokane, Wash. As of June 30, UHS operated 26 acute care hospitals and 301 behavioral health hospitals. 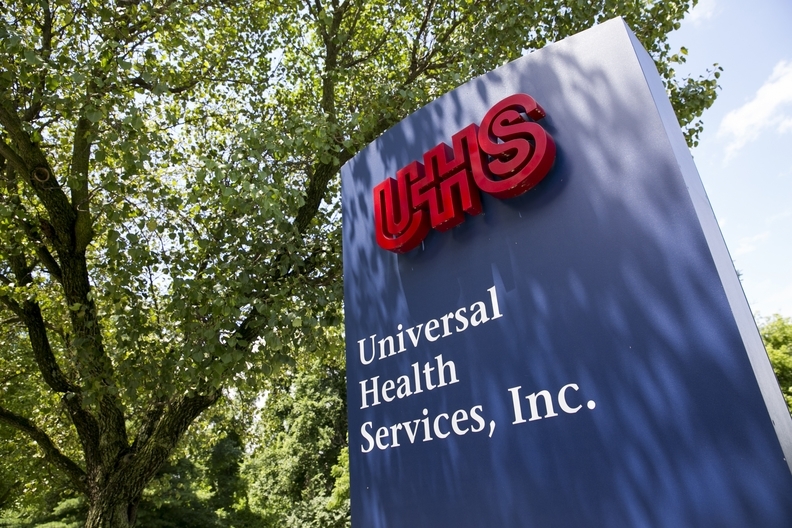 UHS' financial performance was mixed in the second quarter, with revenue just missing analysts' expectations despite a jump in net income. Revenues increased 2.6% to $2.68 billion during the quarter, compared with $2.61 billion in 2017. Analysts with Zacks Investment Research expected UHS' revenue to hit $2.7 billion in the quarter. Net income was $226.1 million in the second quarter of 2018, up 22% from $185.4 million in the prior year. UHS' earnings before interest, taxes, depreciation and amortization was $444.7 million during the quarter, compared with $438.3 million during the second quarter of 2017. Filton said its behavioral side EBIDTA was better than expected in part because of pricing. Adjusted admissions at UHS' acute care hospitals increased 1.9% during the second quarter, and net revenue per adjusted admission increased 3.1%. Overall acute care revenues increased 3.3%. UHS' behavioral health business has been challenged by the increasing proportion of Medicaid patients going into managed care programs, under which Filton said payers tend to be more aggressive in their utilization reviews. Even though same-facility adjusted admissions increased 1.2% during the quarter, adjusted patient days dropped 0.3%. The upshot for UHS, however, is the 3.6% jump in net revenue per adjusted patient day in the quarter. Filton called that an "encouraging development" and said it's due in part to the continuing shift of patients in the company's residential beds into acute beds. UHS' overall behavioral health revenues increased 2.8%. UHS has struggled to hire enough nurses and psychiatrists in its behavioral health facilities, but Filton said he thinks labor markets in some of the company's geographies are now stabilizing. The company has more than 83,000 employees. "Our sense is they have generally stabilized now that we're a couple years into it," he said. "But we're in a very tight labor market."